Once again we see the ugliness of socialism rear it's ugly head! An elementary school in Mt. 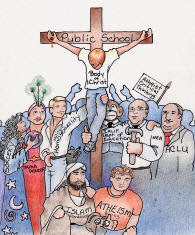 Juliet TN has censored the free speech rights of students by blotting out the terms "IN GOD WE TRUST" and "GOD BLESS AMERICA" from student created posters displayed in the hallway of the school. The Lakeview Elementary School is claiming that using such terms in within the school violates school policy. The posters were created on the students personal time, without the use of school supplies or funds, and included a disclaimer. The school has in turn violated the Constitutional Rights of these students. The right of freedom of speech, and the freedom of religion as well. This is just another reminder of why Christian parents should pull their students out of government run public schools, and place them into private schools, charter schools, or home school them. Mom and Dad your children are being brainwashed by the minions of the new world order. They are being turned away from what their parents have taught them in regards to the subject of morality,virtue, and Christian faith. Whether your Christian, Conservative, or just a concerned parent you should take heed to the "Call to Dunkirk" issued by The Exodus Mandate. Exodus Mandate is a Christian ministry to encourage and assist Christian families to leave Pharaoh's school system (i.e. government schools) for the Promised Land of Christian schools or home schooling. If we really love our children, we will rescue them from the government run schools, where there liberties and minds are being assaulted, and their faith and conscience insulted on a daily basis. This story out of Tennessee is just another piece of evidence as to why the we must act on behalf on our students, and stand for their rights. The socialist left is using America's schools just like Stalin, Lenin, and Hitler used the school systems in there countries to brainwash and indoctrinate students. You can help stop the ACLU by joining a coalition called "STOP THE ACLU"